Compact, free-standing, battery powered pulse generator. The DG2A is a compact, free-standing, battery powered instrument which can be used to generate trigger pulses required for repetitive stimulation. Also featuring DELAY controls, it is useful for determining nerve or axonal Effective Refractory Period (ERP) through the production of a delayed second pulse. This small free-standing instrument unit is especially useful as a frequency generator for use with our DS2A, DS3 and DS7A isolated stimulators which have their own pulse duration controls. 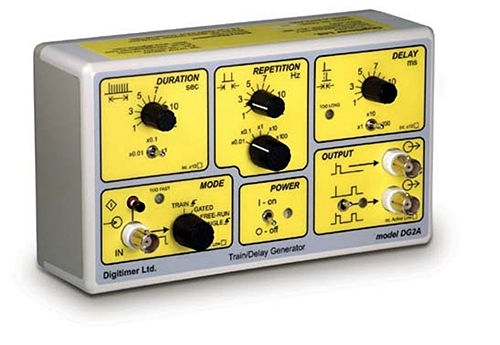 The basic features of it’s predecessor the DG2 Trigger Generator have been extended to allow trains of pulses to be generated in response to input signals from other devices. Control: Four position rotary switch. Movement of this control will immediately terminate any cycle and keep it in a Reset state for about 1 second. This is a useful feature should an exceedingly long cycle be selected by accident. Internal Jumper: Enable “Active Low” – allowing for an Input that is Low during its active phase. Signal: Positive going, 200µs pulse, TTL compatible pulse (5V amplitude). Control: Selection of only the Delayed pulse (upwards) or both the Sync and Delayed pulses. Indicator: Amber LED that flashes for each OUT output pulse. Internal Jumper: Enable “Active Low” – giving an Output that is Low during its active phase. The front panel provides a check-box for marking with a waterproof pen when enabled. Control: ON/OFF toggle. OFF is down. Weight: 490 grams with battery fitted. Please note that no accessories, other than a battery, are supplied.